Ankle foot orthoses can help compensate for muscle weakness and accommodate related structural deformities in patients with Charcot-Marie-Tooth disease, but practitioners are constantly looking for ways to improve suboptimal compliance rates. Lower extremity practitioners who specialize in orthotic management of patients with Charcot-Marie-Tooth disease (CMT) face a host of unique challenges, and many express professional differences about the best strategies to pursue. At the heart of the discussion lies the need to find a balance between correcting and accommodating the weaknesses and deformities associated with the disease. Practitioners understand that orthotic devices can’t actually correct ankle weakness and muscle imbalances, but they can still address them to some extent by maintaining ankle dorsiflexion and compensating for weakness and instability.4 As noted, it’s often difficult to decide how much to try to align the foot and how much to accommodate deformities. McKale noted that most CMT patients often adapt to their physical deterioration with strategies such as taking shorter and higher steps, and by restricting daily activities including running and walking. “They may not be jogging the way they were, or walking the dog as frequently, or walking around the supermarket as much,” he said. When the self-imposed restrictions become frustrating, however, patients may become more open to orthotic intervention. Researchers have shown that CMT patients tend to delay wearing ankle foot orthoses (AFOs) until their ability to walk is so impaired that the choice begins to seem inevitable.6 This transition imposes burdens of its own, of course, including a burden of responsibility on the practitioner. McKale believes that, depending on the patient, alignment is usually more of a priority than accommodation. This pertains particularly to the use of foot orthoses. Instead, McKale tries to functionally post a foot, placing the most pressure on the calluses. Another Windy City denizen prioritizes somewhat differently. Bryan Malas, CO, MHPE, director of orthotics/prosthetics at the Ann & Robert H. Lurie Children’s Hospital of Chicago, believes accommodation has a primary place in the clinical toolkit, particularly in his pediatric patients. Malas said a related problem with compliance is that clinicians sometimes try to force the foot into a position that isn’t attainable. Instead, Malas thinks it’s best in many cases to accommodate the patient’s existing alignment. For example, Malas’s patients tend to be between ages 5 and 9 years, and he’s found that many show limited heel contact during gait. In such patients, a padded heel insert helps redistribute pressure away from the metatarsal head. “If we bring the ground up to the heel and create more contact across the plantar surface, the kids have less fatigue and they’re more comfortable,” he said. Malas may also use a multidurometer foot orthosis to accommodate the plantar flexed first ray that is so common in CMT. Clinicians have had limited success addressing range of motion (ROM) deficits in CMT patients, as it turns out. Malas said practitioners’ attempts to elongate the Achilles tendon using AFOs are misguided. One of the authors on those last two papers, Joshua Burns, PhD, who is associated with both the hospital and the university, emphasized several points about his team’s research in email correspondence with LER. “Our results were similar to those seen in other serial casting studies of neurological patients such as those with post-traumatic brain injury and spinal cord injury,” he wrote. Nevertheless, his team did achieve better gains in ankle ROM than others have, which he attributed to several aspects of the intervention. A 2010 Italian case study spoke to the importance of individual design, as well.8 Clinicians crafted a custom device for a patient who wouldn’t wear his semirigid AFOs because they hampered his compensatory movements and caused pain. The device, which they called a “soft footdrop insert,” consisted of a sheet of a reticulated polyolephinic foam, heated and shaped, and placed in the back of a midcalf boot. The AFO kept the patient’s ankle as close as possible to 90° during swing phase, while its elasticity allowed full ROM in plantar flexion during stance, and its softness alleviated the patient’s previous Achilles pain. A 2008 study from Italy surveyed 25 CMT patients (17 women, mean age about 42) and found that only five of them (20%) reported satisfactory functional results with their AFOs. 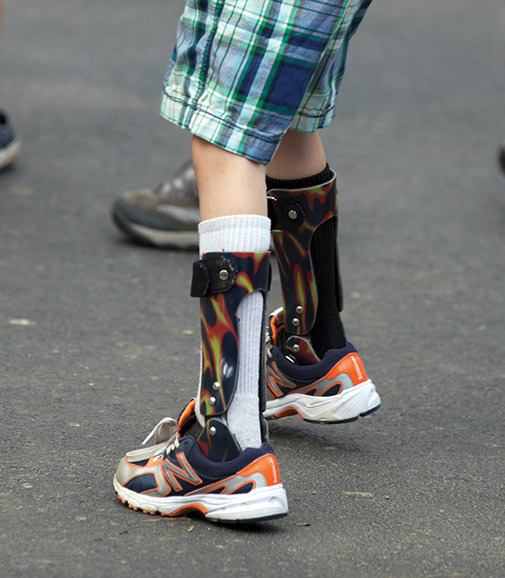 Many felt that the devices highlighted their disability, were uncomfortable, and weren’t essential for their limited daily walking.1 A UK study published in 2011 surveyed 15 CMT patients, as well as their orthotists, and reported several trends. 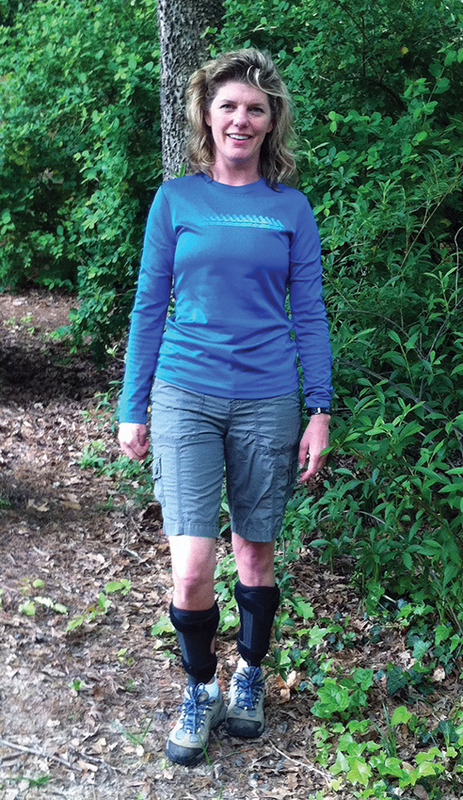 The patients felt that their AFOs improved their walking, but that they sometimes interfered with work, were uncomfortable, or were cosmetically unacceptable.2 Practitioners’ opinions were more variable. “The orthotists we talked to seemed split between those who took a primarily biomechanical view—very much about preventing future deformity—and those who had more understanding of the patients with regard to comfort and cosmesis,” said the paper’s lead author, Margaret Phillips, MD. Phillips, a clinical associate professor in rehabilitative medicine at the University of Nottingham, noted that patients’ concerns sometimes broke out along gender lines. The women, by contrast, were more concerned about having a choice of devices and about cosmesis. 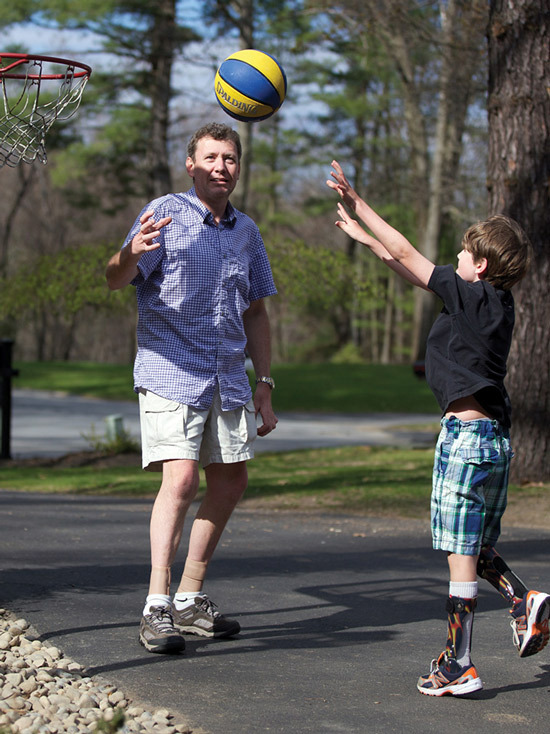 David Misener, CPO, who practices in Albany, NY, is in a unique position to understand the needs of CMT patients because he has the disease himself. Misener, who is 44, was an active child and didn’t start wearing AFOs until his early 40s. Perhaps not surprisingly, he does his best to strike a balance between compensation and accommodation. 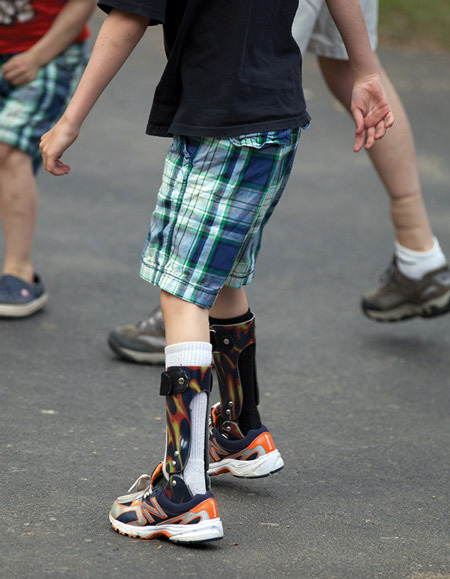 “I think most practitioners need some education in how to treat a CMT foot,” he said. Misener explained that the foot’s inversion and related pathomechanics are often driven by a plantar flexed first ray, but there are usually coexisting neuropathic issues that demand protective and corrective padding. Because CMT is a progressive disease, patients may need different things at different times. As patients weaken over time, practitioners should respond to the disease’s progression with a progression of their own, he added—starting with custom foot orthoses, then a lightweight AFO that primarily addresses foot drop, then onto stronger systems that store and release energy during gait. For Misener, the first step is to establish the patient’s objectives. Psychological issues play a part, too. 1. Vinci P, Gargiulo P. Poor compliance with ankle-foot-orthoses in Charcot-Marie-Tooth disease. Eur J Phys Rehabil Med 2008;44(1):27-31. 2. Phillips M, Radford K, Wills A. Ankle foot orthoses for people with Charcot Marie Tooth disease: views of users and orthotists on important aspects of use. Disabil Rehabil Assist Technol 2011;6(6):491-499. 3. Kamp JJ. Orthotic management of Charcot-Marie-Tooth. J Prosth Orth 1994;6(4):108-112. 4. Pal S. Charcot-Marie-Tooth patients respond to AFO management. LER 2011;7(3):38. 5. Refshauge KM, Raymond J, Nicholson G, van den Dolder PA. Night splinting does not increase ankle range of motion in people with Charcot-Marie-Tooth disease: a randomized, crossover trial. Aust J Physiother 2006;52(3):193-199. 6. Ramdharry GM, Pollard AJ, Marsden JF, Reilly MM. Comparing gait performance of people with Charcot-Marie-Tooth disease who do and do not wear ankle foot orthoses. Physiother Res Int 2012;17(4):191-199. 7. Ramdharry GM, Day BL, Reilly MM, Marsden JF. Foot drop splints improve proximal as well as distal leg control during gait in Charcot-Marie-Tooth disease. Muscle Nerve 2012;46(4):512-519. 8. Vinci P, Paoloni M, Ioppolo F, et al. Gait analysis in a patient with severe Charcot-Marie-Tooth disease: a case study with a new orthotic device for footdrop. Eur J Phys Rehabil Med 2010;46(3):355-361. 9. Rose KJ, Raymond J, Refshauge K, et al. Serial night casting increases ankle dorsiflexion range in children and young adults with Charcot-Marie-Tooth disease: a randomized trial. J Physiother 2010;56(2):113-119. 10. Rose K, Burns J, Wheeler D, North K. Interventions for increasing ankle range of motion in patients with neuromuscular disease. Cochrane Database Syst Rev 2010; 17(2): doi: 10.1002/14651858.CD006973.pub2. 11. Guillebastre B, Calmels P, Rougier PR. Assessment of appropriate ankle foot orthoses models for patients with Charcot-Marie-Tooth disease. Am J Phys Med Rehabil 2011;90(8):619-627. I am a 65 year old male with CMT. I am a serious biker and don’t want to give it up. I have lost a lot of my calf muscles and my balance is getting worse. I cannot stand in one place more than a minute. I wear an AFO on my left foot for foot drop. I need more for balance, gait, and standing on my pedals. Who is out there that understands this condition well enough to help an active person?